The ozone layer’s continuing depletion has made owning a shade sail a necessity, not a luxury. Shade sails allow us to enjoy the sun without the danger of being exposed to its harmful UV rays. They even serve as protection for the things we own, like our cars. Shade sails allow us to simply enjoy the outdoors. 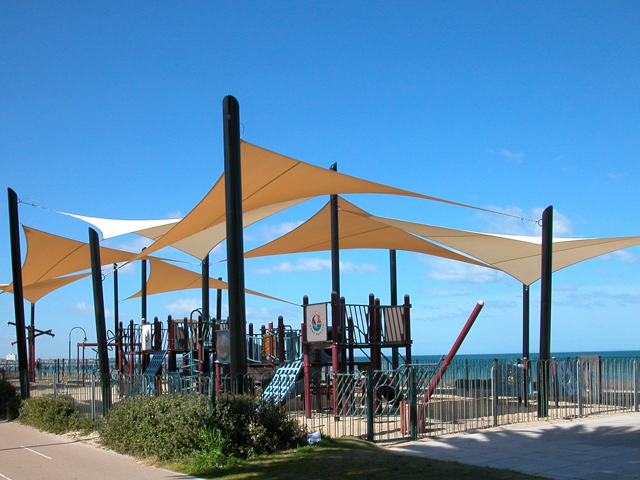 So effective are shade sails, in fact, that they have even been made mandatory in some places like in city councils, schools, kindergartens, and corporations. Yes, shades have become a part of our way of life. Choosing the right kind of shade is very important. Here at Urban Shade, we can help you find the right shade for you. We make use of only the best tension shade fabrics that are available in the market today – all of them are made by a reputable manufacturer. We offer a wide range of color swatches and types of fabrics to choose from. The Rainbow Shade Series is recommended by architects, engineers, and manufacturers for its quality and color range. This fabric has been tried and tested for over 13 years. Newer fabrics like the Coolaroo Commercial 95 were developed to be very strong and very stable fabrics. They are ideal for both shade awnings and tension structures. Sarlon Supershade Plus is best for commercial overhead structures. They are designed to provide extreme protection from the sun as well as from extreme weather conditions (such as hail). The Sarlon Supashade Plus uses the latest low-shrink yarn extrusion techniques. They are made of High-Density Polyethylene monofilament yarn, so they maintain their form even when tensioned. Ferrari Vinyl uses the Precontraint Ferrari technology that gives it outstanding mechanical strength and exceptional weightlessness. This vinyl is also very intelligent –the high tenacity polyester yarn actually prevent accidental tears worsening. While we can make a custom design for you, we also have a wide variety of ready-made shade sails to choose from. They are available in do-it-yourself kits or they can be professionally installed. Our giant patio umbrellas are the best value for your money in the market and its designs are truly classic. There is the Giant Swinging Retractable Umbrella that available in four-meter and five-meter sizes. These umbrellas are easy to install and they collapse easily when not in use. They can rotate 360 degrees, making them extremely versatile. They are ideal for outdoor pools, for covering outdoor tables and chairs for lounging, etc. Use them any way you want! Sunny Australia is picture perfect, but in reality, the Australian sun is harsh and unforgiving. Sure, it is great to get the most out of the sunny weather by staying out, but you need to do so with adequate sun protection.Shade sails (also called shade canopies or sun shelters) are perfect for outdoor activities like picnics, barbecues, and sheltered play area. Shade sails make for useful and beautiful outdoor protection in your home. At Urban Shades, we offer a wide variety of shade sails for your home – you will surely find one that fits your requirements and taste. By Malibu Shade|March 30th, 2016|Shade Sails|Comments Off on Why Use Shade Sails?